D&D Technologies is the designer and manufacturer of the MagnaLatch® magnetically triggered gate latch and TruClose® self-closing, polymer safety gate hinges. • Pool fencing Standards, Codes and regulations vary from region to region. Before installing pool gates and fences check with the local authorities in your area to ensure that you comply with local requirements. • Pool gates and fences should be made with the most durable materials. They should be sturdy and free from damage, cracks or holes that might exist within the structure. 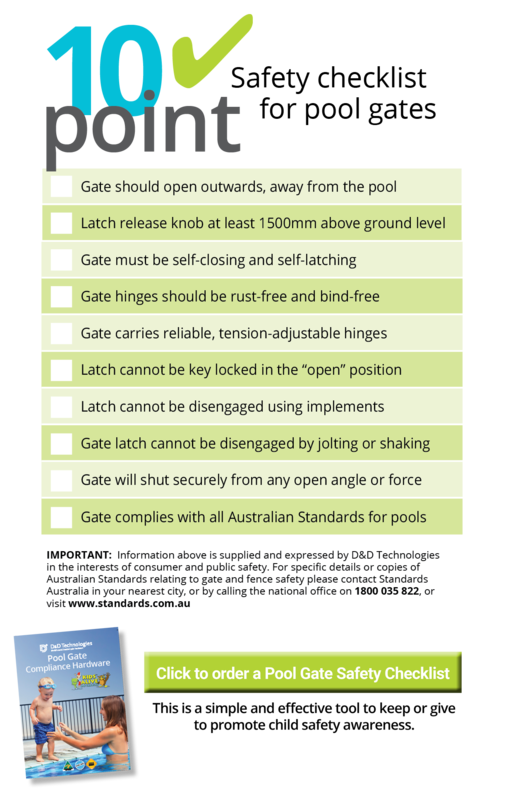 • Gates should be self-closing and self-latching. Gates should open outward, away from the pool. Gates and fences should be at least 1.2m above the ground-fixing surface, and the gate latch release mechanism should be at least 1.5m above the ground-fixing surface. • Pool gates and fences should not present footholds or climbing opportunities to children under 5 years. Check with your local authorities to ensure your gate and fence comply with such requirements. • Vertical or horizontal air gaps between the pickets, balusters, palings and glass panels should not exceed 100mm at any point. Latch cannot be opened using implements or shaken or jolted open or key locked in the “open” position and will latch from any position, including from resting on the latching mechanism. • Never prop open a pool gate. Make sure the gate latch remains in proper alignment in order for it to latch securely when the gate closes every time. • Never leave children unattended in the pool, adult supervision is the most important safety factor.